Small tree or bush up to 3 m. high; bark grey, longitudinally fissured; young branches yellow-brown pubescent. Leaves opposite or 3-verticillate; lamina coriaceous, oblong-ovate, ovate or obovate, up to 35 cm. long, 9–13 cm. wide on mature trees (more information is needed to verify these observations), apex obtuse or subacute, base shortly attenuate, margin usually slightly sinuate; upper surface drying olive-brown, subglutinous, glabrescent except for the yellow-brown indumentum on the prominent midrib and lateral nerves; lower surface yellow-brown with light brown venation, venation with white to buff tomentum obscuring the sparse scales in the areoles; midrib, lateral nerves and reticulation strongly prominent beneath, laterals 8–20 pairs; petiole stout, up to 3.5 cm. long, leaving large sunken scars at the swollen nodes of the older branches. Inflorescences axillary clusters of brown tomentose racemes 9–11 cm. long, usually 6 in number, sometimes borne along a short (2–3 cm. long) tomentose axillary shoot. Lower receptacle 2–2.5 mm. long, velutinous-tomentose; upper receptacle cupular, 3–4 mm. long, 3–4 mm. in diameter, pubescence decreasing in density and becoming greyer towards the shallowly triangular sepals. 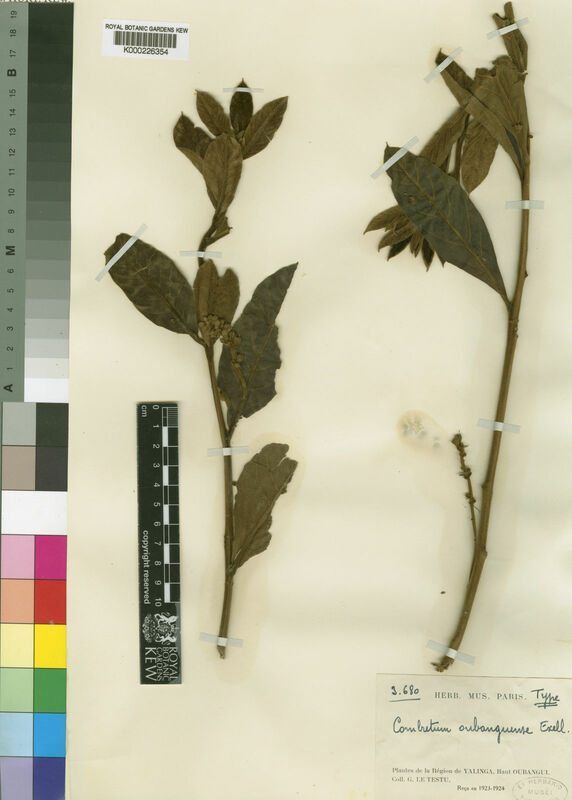 Petals broadly obovate, 2–2.5 mm. long, 1.5–2 mm. wide, glabrous. Stamen-filaments slender, 5–6 mm. long; anthers 1 mm. long. Disk 2 mm. in diameter, with long-pilose margin free for 0.5 mm. Style up to 6 mm. long. Fruit (fig. 4/12, p. 15) oblong-elliptic in outline, 3 cm. long, 2.3 cm. wide, pubescent at first, then glutinous, eventually wings a silky yellow-brown with darker shortly pubescent and glutinous centre; stipe stout, 2–3 mm. long, pubescent. Scales (fig. 2/12, p. 13) 50–65 μ in diameter. Probably wooded grassland; 750–1200 m.
Jongkind, C.C.H. (2014). 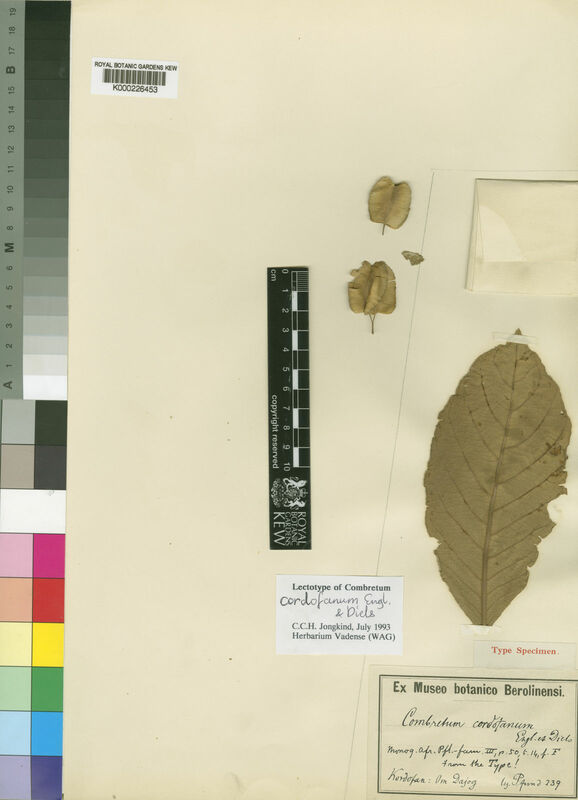 Notes on African Combretum Loefl. 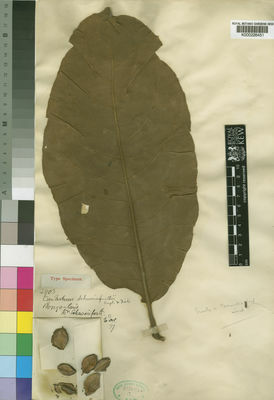 Species (Combretaceae) Adansonia, sér. 3, 36: 315-327. Fl. For. Soud.-Guin. 108, t. 15, 1–2, incl. var. passargei (Engl. & Diels) Aubrév.